Health informatics is an exciting career field which includes elements of computer science, information technology and health care delivery. Enrolling in a master’s degree program is appropriate for health care professionals who are looking a second career or who wish to explore a new career path, as well as those who are currently working in computer science or IT and want to work in the health informatics field. 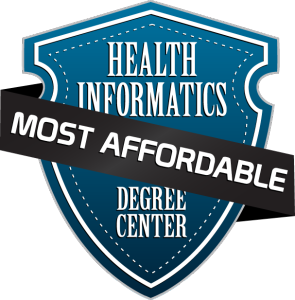 If you are currently working in health informatics and want to qualify for a management position you will also want to look at one of these affordable master’s in health informatics degree programs. The schools that were considered for this list had to first meet the requirements of being an accredited school offering a master’s degree in Health Informatics. From that list, we the most affordable based on data from The National Center for Education Statistics (NCES), which is the federal entity for collecting and analyzing U.S. education data. UMass Lowell’s graduate degree in Health Informatics provides two areas of concentration; Health Informatics and Health Management. These are 12-course master’s degree programs, which prepare students with the skills to assess and provide high-quality, cost-effective health services. The University of Massachusetts Lowell was established in 1894 and is part of University of Massachusetts education system, and is also known as UMass Lowell. UMass Lowell is a public research facility with 1,100 faculty members and approximately 17,000 students. It is the second largest public institution in Massachusetts. This master’s program is run on a cohort basis, with classes starting in August and January. Students attend classes on Friday evenings and all day Saturdays to complete 42 hours of coursework n 13 months. In addition, they complete a two-month individual capstone project to graduate. Lipscomb University was founded in 1891 by David Lipscomb and James A. Harding. Both men believed that a true education included spiritual growth as well as academics. This Christian institution still offers a faith-based education to its 1,690 graduate and 2,890 undergraduate students. It is one of the top 20 regional master’s universities in the South, according to U.S. News & World Report (2014). UIC’s master’s program offered 100 percent online. Students have the flexibility to study from anywhere they can get an Internet connection. A select group of students enrolled in this program will be invited to pursue the Research Track, which will be a good fit for those planning a career in this area. The University of Illinois at Chicago is a respected research university that is one of the top 200 research-funded institutions in the world. Its student body is made up of 10,669 graduate students and 16,911 undergrads. More than 25,000 students are enrolled in the University’s online programs, including 77 masters and 74 bachelors programs. The Health Informatics program includes core courses in management and leadership in health sciences, issues and policy in health sciences, instrumentation and procedures for data collection, and analysis of variance. Students choose to write a thesis or complete a project to graduate. Ohio State University is ranked in the Top 20 among national public universities by U.S. News & World Report’s list of “America’s Best Colleges” (2013). With a total enrollment of 63,058, it is one of the largest schools in the nation. OSU’s 14 colleges offer 175 undergraduate majors and 240 master’s doctoral and professional degree programs. The M.S.B.I. program evaluates applicants for admission year-round. Students may apply for admission into the fall, winter or summer semesters. Priority is given to applicant who hold a clinical degree. Demonstrated competency with computers (through work experience or credentials) is also required. Nova Southeastern University is a not-for-profit, independent school that was established in 1964. Approximately 27,000 students are enrolled at NSU, which is classified as a research university. The school is accredited by the Southern Association of Colleges and Schools Commission on Colleges. The 40-hour degree program is divided into three sections: informatics, leadership, and discipline focus. A number of the courses are offered online. Students work with their faculty adviser to develop a plan of study that will meet their career goals. They complete a research project and a practicum to graduate. The University of Kansas is a major public research and teaching institution. About 28,000 students take classes on its five campuses (Lawrence, Kansas City, Overland Park, Wichita, and Salina). Learners come from all 50 states and 105 countries to study at KU’s 13 schools. It is ranked at No. 46 in graduate academic programs by U.S. News & World Report. The MS in Health Informatics offers a Health Information Management Track. Students get the skills and knowledge required to prepare them for careers in doctors’ offices and health care organizations. The program allows students to understand the steps involved in transitioning from a paper file system to an electronic one. The University of Alabama is a public research institution that was founded in 1831. It offers programs in 13 divisions leading to undergraduate, graduate, doctoral and Education Specialist degrees. UA has been ranked as one of the top 15 public universities in the country by U.S. News & World Report. The University offers two Master of Science program options for students: the MS Thesis and the MS Non-Thesis. The Non-Thesis option is designed for active clinicians who prefer not to participate in an active research project or to prepare a thesis. The Thesis Option requires 30 hours of coursework and seven research hours leading to a thesis. The University of Utah is a public space-grant research university. The University was established in 1850 as the University of the Deseret, which makes it the oldest institution of higher education in the state. It is the state’s flagship institution and offers more than 92 graduate programs and 100 undergraduate majors. The Master’s program is offered through UCF’s Continuing Education Division. Students are charged a fee in lieu of tuition. This program requires 36 credits (along with any prerequisite work) and includes courses in project management, database management, health care informatics, health-services management, and a seminar on health care informatics research. The University of Florida is the second-largest university in the country. It has been named an “Up and Coming” national university by U.S. News & World Report, as well as a best-value university by The Princeton Review. UCF has also been named one of the country’s most affordable schools by Forbes. Students enrolled in the Master of Biomedical Informatics (MBI) program complete 52 credit hours (46 hours of coursework and six hours capstone project work) to graduate. Three Tracks are offered: Bioinformatics and Computational Biology, Clinical Informatics, and Health Information Management. A full-time student should be able to finish in four-five quarters. The University of Oregon is a public research university. Founded in 1876, its first class graduated two years later. The University is organized into eight schools and colleges. A total of 24,548 students attend Uo; 20,808 of which are undergraduates and 3,740 are graduate students. Two Health Informatics (HI) Master’s Degree (M.S.) programs are offered at MU. A traditional, on-campus is available, and it can be completed on either a full or a part-time basis. The Exective HI Program is a distance learning program, and it welcomes students from across North America and around the world. The University of Missouri was founded in 1839 and was the first public university to be established west of the Mississippi River. Today, it is the state’s largest public research university. Mizzou has 35,000 students from every county in the state, as well as every state in the nation and 120 countries as part of its student body. The Master of Science in Health Care Informatics (HCI) program can be undertaken on a full or part-time basis. The curriculum includes courses in database and project management, network design, systems analysis and design, and decision support. UWM is a world-class university that offers 183 degree programs to 28,000 students. This public research university is the largest university in the Milwaukee metropolitan area and the second-largest university in the state. The Master of Health Informatics (MHI) degree was developed for students from various backgrounds. It can be completed in as little as one calendar year on a full-time basis. Students can also pursue this degree part-time. An MD/MHI joint degree program is available; it requires an additional year of coursework in addition to the four years of medical school. The University of Minnesota is one of the largest universities in the nation. It offers undergraduate, graduate, and post-graduate degree programs in almost every field of study. Enrollment at UM is close to 65,000 but the student-to-faculty ratio remains low at 16:1, which ensures that students get the individual attention they need. UNC Charlotte is an urban research university. It is a large public university that has still managed to hang onto a small college feel. More than 26,000 students are enrolled on its 1,000-acre campus. The MS in Healthcare Informatics program requires 60 credits to graduate. Students complete a capstone project, as well as courses in predictive analytics, IT project management, predictive analytics, healthcare information systems, decision support systems, and strategic management of the healthcare organization. The program can be completed in 15 months. California College San Diego has been offering degree programs since 1978. This school offers career-based educational programs which focus on real-world knowledge and skills. New classes start monthly, so new students do not have to wait long to start to work on their degree programs. Through the core curriculum of this program, students will gain knowledge of the healthcare system as well as information science, healthcare policy, cognitive, organizational, and behavorial science. Students complete an internship as an essential feature of their learning experience. The required 400 hours may be completed during the summer between the first and second year or on a part-time basis through the academic year. The University of Michigan is one of the oldest public universities in the county. It is one of the most well-regarded institutions of higher learning in the world and is consistently ranked among the best universities in the nation. The MS degree is a 36 credit-hour program. Students enrolled in the program can choose a Masters’s project, write a thesis or complete a capstone project as one of the requirements for graduation. The thesis option is recommended for students who plan to continue their education toward a Ph.D.
Kent State University is a public research university with over 27,500 students in attendance. There are eight campuses in the Northeast Ohio area, with the main one located in Kent. KSU is one of the largest universities in Ohio and it has been ranked as one of the top research universities in the U.S. The USF Health Informatics degree can be completed 100 percent online. Students enrolled in this program must complete all coursework with a minimum of grade point average of 3.0 No grades of C- or below will count toward the degree. Students take 26 credits in core courses and 6 credits in elective courses to graduate. The University of South Florida is consistently ranked as one of America’s Best Colleges by U.S. News & World Report. The Morsani College of Medicine has a reputation for its innovative curriculum which emphasizes improving healthcare through research, clinical activities and interprofessional education. Total coursework required for this program is 36 credit hours. Students must also complete a practicum, as well as take and pass a comprehensive examination to graduate. Students must take courses in information organization, information and knowledge professions, and information access and knowledge inquiry, six hours in guided electives (information science courses), and 12 hours in other electives to satisfy the requirements for this degree). UNT is one of the largest universities in Texas. The school offers 98 bachelors’ and 82 master’s degree programs. Thirty-eight doctoral degree programs are also available. It has been ranked No. 1 for in Texas by the Association for the Advancement of Sustainability in Higher Education. The Masters Degree-Medical Informatics is a 39-credit program that can be completed on either a full or part-time basis. It is designed to be appropriate for students from a wide variety of backgrounds. The curriculum includes courses in medical decision support systems, medical imaging systems, database systems, and network architecture. Students also complete an independent research study in medical informatics. Formally known as the State University of New York Health Science Center at Brooklyn, SUNY Downstate Medical Center was founded in 1860. It is now one of the leading urban medical centers in the country and the only academic medical center in Brooklyn. The health informatics field is a growing one which is creating a number of exciting career opportunities. By early 2014, all medical facilities receiving Medicaid and Medicare funds were required to adopt an electronic filing system for medical records, and a number of facilities, ranging from hospitals to nursing homes will need to hire and retain personnel to manage and maintain them. To train for these careers, consider one of these affordable Master’s in Health Informatics degree programs.